The Gospel of Mark has a couple of possible (disputed) endings. I wrote a couple of weeks ago about the options for how to understand Mark’s closing chapter. It is the so-called longer ending of Mark that has Jesus appearing to some of his followers and talking about their picking up snakes and drinking poison. Of course, even if the longer ending is authentic and original to Mark, there is still the matter of interpretation. As a way to complete my review of BibleWorks 9, I set out to use BibleWorks to try to examine some of the manuscript evidence. A BibleWorks module of Daniel Wallace’s Greek grammar (included in BW9) offered some insight into interpretation, which you can read briefly here (screenshot). For the first time, the New Testament Critical Apparatus from the Center for New Testament Textual Studies is available for PCs. This exhaustive apparatus covers the entire New Testament. The BibleWorks version has been enhanced to show a matrix of Aland categories and time period for the mss for each reading. 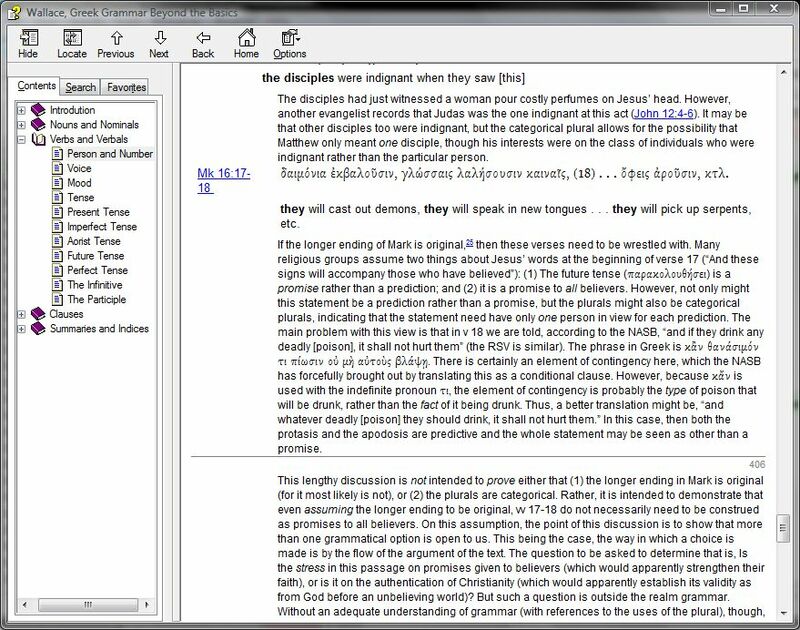 Users will especially appreciate having the apparatus track and update as the mouse moves over the text in the BibleWorks main window. In addition, the start of each verse entry summarizes the significant, insignificant, and singular variants. When examining a variant, the text of the verse is shown with the variant text highlighted. No unlock required! You can’t get NA27 and its textual apparatus in BibleWorks but with what CNTTS offers (it’s thorough), it doesn’t matter! 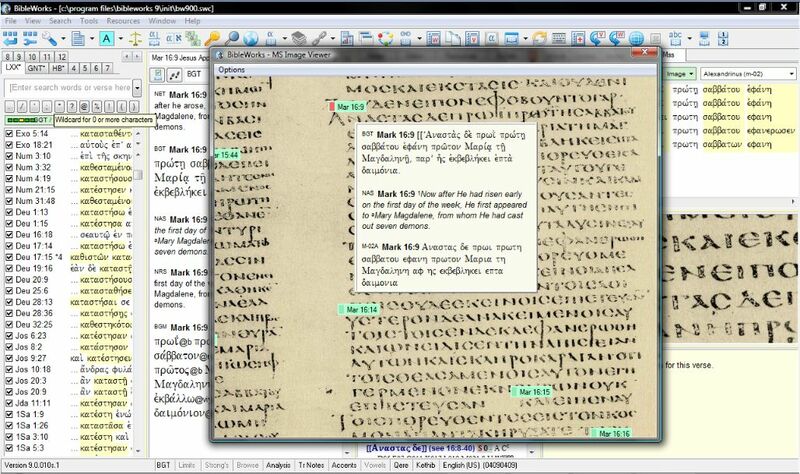 Greek textual critics benefit immensely from the additions in BibleWorks from version 8 to 9. BibleWorks has some great mini-training videos. Here they explain the CNTTS Apparatus. And here they discuss the Manuscripts Tab. If you’re serious about either (a) considering purchasing BibleWorks 9 or (b) have it and want to figure out how to use those two features, those two videos will get you there. Now, on to the manuscript evidence regarding Mark’s ending in BibleWorks 9. This gives an idea of what the program can do in an applied Bible study. If I’m wondering what Codex Vaticanus (“B”) has in Mark 16:9, I can simply select that Codex in the drop-down menu in the Mss Tab. (BibleWorks refers to it as m-3, too.) The screenshot below (click for larger) shows that there’s no image for Vaticanus at 16:9. This is because Vaticanus ends Mark at 16:8. 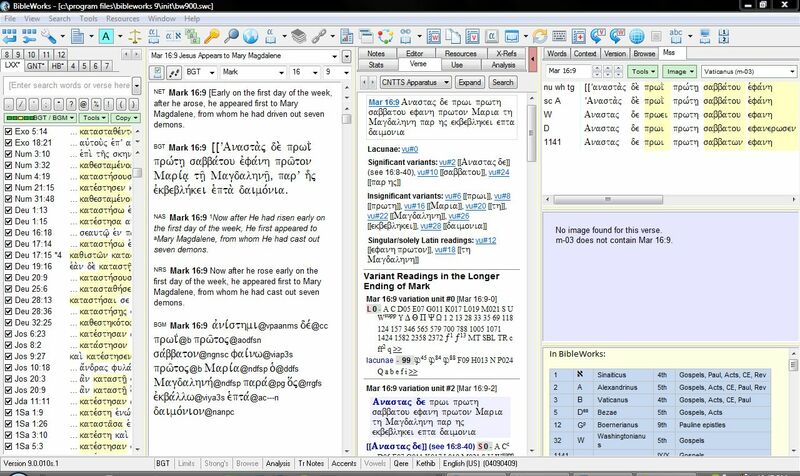 Hovering over the verse references (superimposed over the manuscript) brings up the pop-up window that you see there, where I can compare the given manuscript, the English, and the BGT Greek text in BibleWorks. (!!) This is all pretty amazing. The Mss Tab is easy to figure out. Using the CNNTS Apparatus was less than intuitive for me. But this BibleWorks video explained it quite well. I’ve had to work at it to figure out how to best use it, but having done that, it’s a great apparatus. Especially helpful is its classification of variation types (significant, insignificant, lacunae, etc.). The Apparatus is chock full of abbreviations to learn, but what critical apparatus isn’t? And this one hyperlinks the abbreviations to what they stand for, so it’s not too bad. 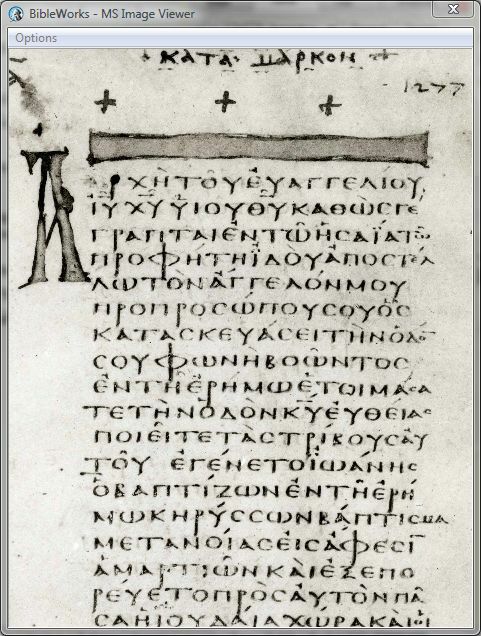 For the Greek manuscripts that include some parts of the Septuagint (Sinaiticus, Vaticanus, Alexandrinus), I would love to be able to see both testaments in future BibleWorks editions. That was a loss for me, especially given my appreciation of the Septuagint. So be aware that even though BibleWorks has images of manuscripts that contain parts of the LXX, it’s just the New Testament that appears in BibleWorks. But the images are already some 8 GB, and this is a work in progress (with future updates promised), so the lack of the LXX/Old Greek is understandable. Viewing Hebrew manuscripts in the future would also be awesome! Until then, what BibleWorks includes and gives the user access to (as part of the purchase price) is pretty remarkable. BibleWorks won’t actually answer the question I posed in the title of this post: Would Mark’s Jesus have us handle snakes and drink poison? Exegetes will always have to interpret and answer questions like this. (This one’s a bit of a softball, admittedly.) BibleWorks also can’t determine with certainty what the actual ending of Mark is. But it can sure show you a lot of evidence, and give you just about everything you need to try to have an informed opinion on the matter. Being able to look at images of actual manuscripts still boggles my mind. And it’s not only being able to view those manuscripts (much of which you could do online anyway)–it’s the fact that they’re tied to BibleWorks’ analysis tools that’s truly astounding to me. BibleWorks has enhanced my Bible study immensely. BibleWorks 9 is easily a five-star program in my book. I’ve enjoyed being able to review it. See all that’s new in BibleWorks 9 here. I received a free upgrade to BibleWorks 9 in exchange for an unbiased review. (Thank you, BibleWorks!) See the other parts of my BibleWorks review here. You can order the full program here or upgrade here. It’s on Amazon (affiliate link), too. At http://www.curtisvillechristianchurch.org/AuthSuppl.html there are some additional manuscript-pictures and page-replicas, along with links to a couple of video-lectures on the subject. Regarding Vaticanus: be sure to notice the prolonged blank space that appears after Mk. 16:8; this blank space includes an entire blank column. Can you use the BibleWorks images to discern how many other books in Vaticanus in the New Testament have a blank column placed at the end? 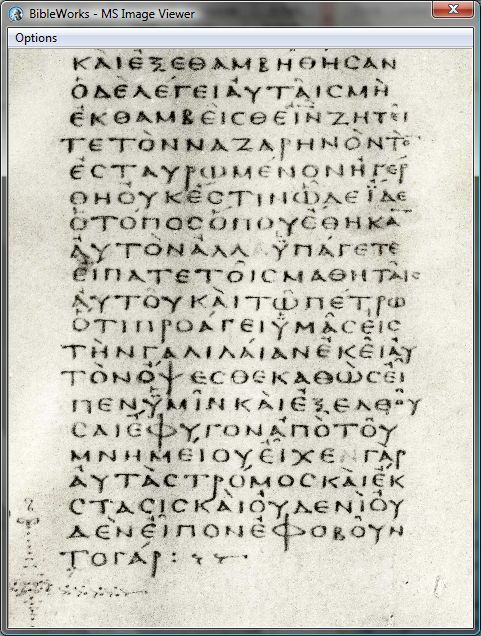 Regarding Sinaiticus: does BibleWorks point out that the pages containing Mark 14:54-Luke 1:56 are replacement-pages, not written by the same copyist who produced the surrounding pages? Also, if you enjoy direct access to images of manuscripts, I recommend visiting the Virtual Manuscript Room and requesting access to their extensive microfilm library. Hi, James–thanks very much for the link. Looks like there’s a wealth of great stuff there to explore. Thank you! I don’t have BibleWorks in front of me at the moment, but I would think the answer to your first question is yes, you can use the BW images to see how many other books in Vaticanus end with a blank column (if any others do). On your second question–without BW in front of me, I’m not sure, but the text-critical and manuscript notes in BibleWorks (between the NET Bible study notes and the CNNTS apparatus and associated notes) are pretty thorough. That sounds like at least the kind of thing that would be noted. Thanks again for the link and the comment–I look forward to spending some time with what you posted! Read Dean Burgon’s The Last Twelve Verses Of Mark for a pretty complete answer to your question in the title. Thanks for the suggestion–I’ll check it out.